Artist and illustrator Lauren Kaelin lives in Brooklyn with her wife, their tortoise and their pup. Her paintings have been exhibited at Fowler Art Space in New York and featured on Anderson Cooper Live. 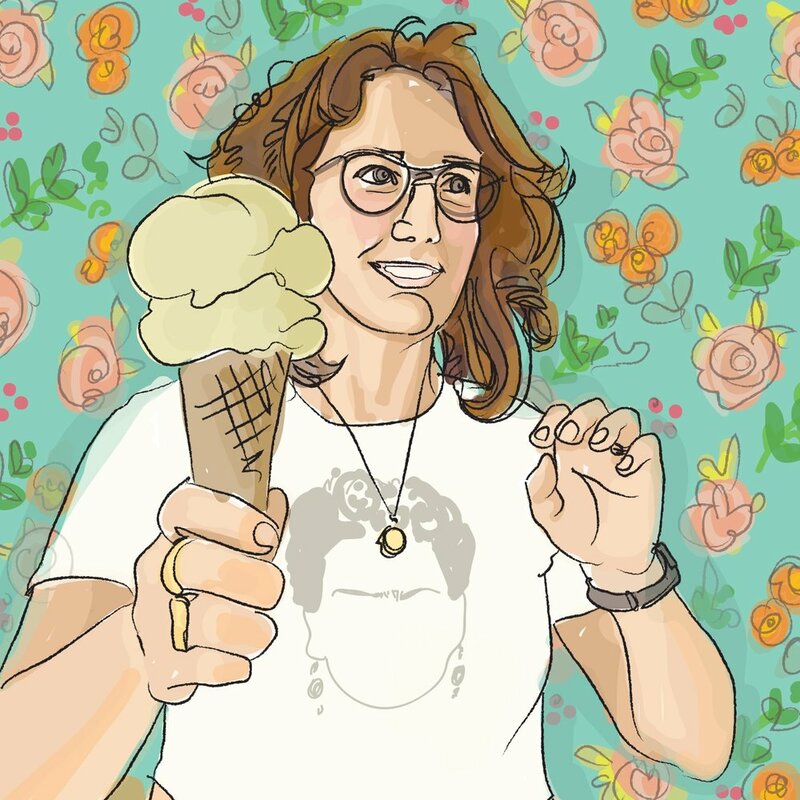 She is the art director at Ample Hills Creamery, creator of Benjameme: A Work of Art in the Age of the Internet, and co-founder of viral website When Parents Text.Her books include Ample Hills Creamery: Secrets and Stories from Brooklyn's Favorite Ice Cream Shop and When Parents Text: So Much Said...So Little Understood. "A Day in Her Life." Things Girls Do. November 2015. "Ample Cream + Creativity From Brooklyn’s Ample Hills" acenatural.com. September 2015. "How Brooklyn Creamery Ample Hills Dreams Up its Colorful Flavors" mentalfloss.com. March 2016. "Lauren Kaelin Paints Memes" motherboard.vice.com. October 2013. "These Internet Memes Art Pieces Should Be in a Museum." gizmodo.com. June 2013. “Benjameme: Lauren Kaelin Paints Internet Memes In Hilarious Tumblr Project” huffingtonpost.com. June 2013. "Ermahgerddon: The Untold Story of the Ermahgerd Girl." vanityfair.com. October 2015. “The Meme as Art: Painter Sophisticates Cyberculture” time.com. June 2013. "Are memes the pop culture art of our era?" digitaltrends.com. June 2013. "The art of the meme." timeoutny.com. March 2013. "Oil paintings of your favorite internet memes." visualnews.com. June 2013. "The Fine Art of the Meme." relevantmagazine.com. June 2013. "'Who's Taylor Swift Anyway?' takes on a pop-country princess." Boston Globe. March 2014. "Brooklyn's Most Beloved Ice Cream Shop Creates A Special Flavor For T" nytimes.com. April 2014. "Star Wars ice cream joins the yummy side of the Force." cnet.com. December 2015. "Taste the Force with Ample Hills' Star Wars flavors." Metro. December 2015. "NYC Restaurants Don't Miss a Beat with CPR Signs." foodfanatics.com. March 2014. "Text Messages Bringing Parents And Kids Closer?" Tell Me More, npr.com. August 2011. "Parents, Beware: Your Texts Could End Up Here." Grecourt Gate News, smith.edu. May 2011.